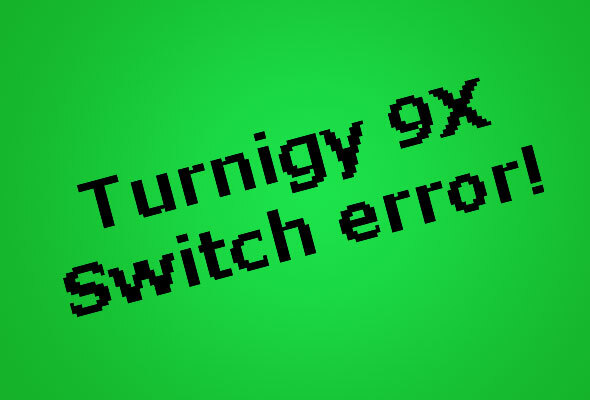 If the Turnigy 9X just beeps and says "Switch Error", you must set the switches in correct position. When you start up you Turnigy 9X transmitter, it might beep and say “switch error”. The users manual doesn’t mention this for some reason and it can take a while to figure out how to solve it. What you need to do is to set the switch in a specific position. The switches on the front must be set towards the top and the switches on the top must be set towards the back. I hope this could solve your problem with the switch error. Thanks! Just got my 9x and couldn’t figure out why it wasn’t turning on. You saved me a world of rage. I’m glad to hear that =) Good luck with your new receiver! wat zou het dan nog kunnen zijn ? I guess that means that you have all your switches in the right position and still get the error message? Unfortunately I don’t have the answer to that problem? In my case it just worked when I aligned the switches. I did every position which is possible with those switch, rebooted it and still got this message all the time – switch error. I’m Sorry but I don’t know what else could be wrong. Maybe a switch i broken or something? I do have the same problem! All different switch positions tested but it is still in SWITCH ERROR. You saved me like so many others quadcopter jesus! “Please try to understand this.”That is a safety thing that the manufacture has put in the radio so as to not transmitte to receiver.I know that from Airtronics had that setup.If you are flying heli it very important to have a radio with that sort of setup.Your switches are all set for transmition. Copyright Multicopter World. All Rights Reserved.